In the fall of 08 there was a call for proposals called the MLTT Initiative. This stands for Multidisciplinary Learning and Team Teaching. Together with my collaborator from the FIRE project, John Marshall (School of Art and Design) and a colleague, Max Shtein from Materials Science, we submitted a proposal for a joint course. We recently received final word that our project was supported. 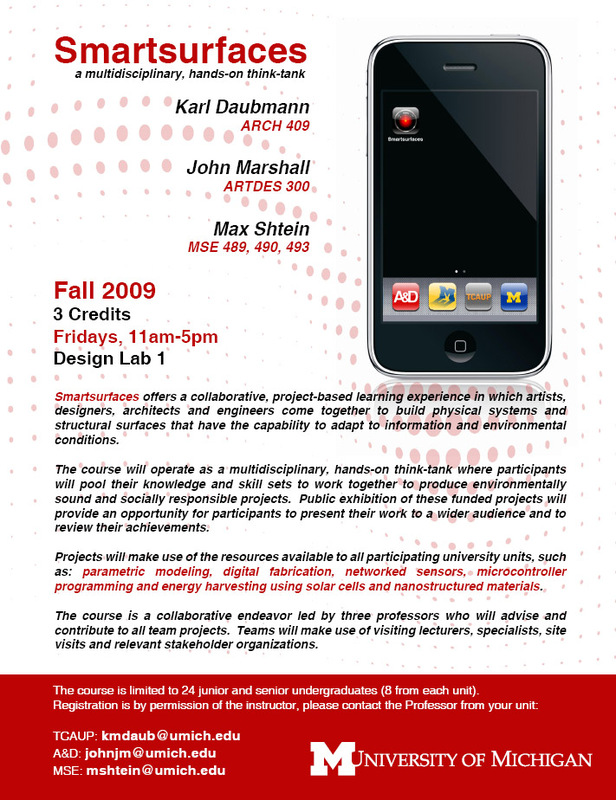 In the fall of 09, the three of us will be team teaching a course called SmartSurfaces. The course will bring students from Architecture, Art, and Engineering together to develop a series of ‘responsive environments’. 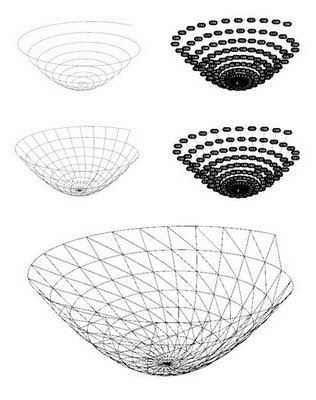 We hope to build a multidisciplinary community around the exploration of structural systems and surfaces augmented by networked computing elements that have the capacity to learn and adapt to new information and conditions. Here is the poster advertising the new cross listed course. We had our second session with Marc Fornes this week and we started with a discussion of surfaces. 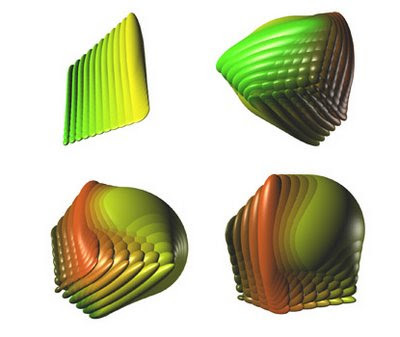 The logic of surfaces relies on U and V instead of X,Y,Z. In the following studies I convert the UV back to XYZ so that I can map the height of the parts. The color is used to distinguish height. On my first iteration the color was gradual. In the included images, I rounded the values to the nearest 10 so that there are height contours shown with the color. 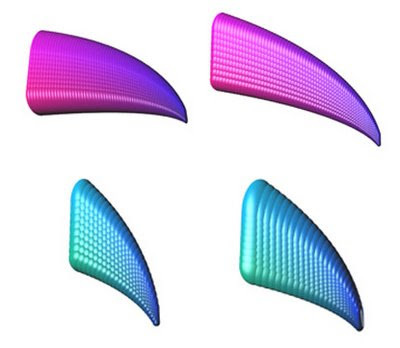 The studies were useful to get a better handle on arrays, capturing and using lists of values to map the cones to the surface and capture their Z values to control the color. Here is a link to the script. Caution as it might be a bit sloppy as I was throwing all sorts of variables in to get it to work. Building on the first scripting session I had a chance to play a bit more. Using the simple equation for a spiral, I created a curve to link the points, and then a series of lines to link other points. I guess it is a spiral bowl of some sort. The black dots are text dots so I can be sure which points to link with the lines. This can be turned off or on easily within the script. Here the loop helps to create the spiral. This was much harder to do with Grasshopper given the lack of looping. Here are a series of variations that manipulate the spiral equation to get different effects. Here is a link to the rhino script file. This semester we have Marc Fornes doing a visiting grad options studio. In addition to that, we convinced him to do a few workshops for the faculty. So far we have had one 3 hour session and we were already making things. It was a great session, not stuck in the tediousness of variable types or anything like that, instead we made something, kept building, and could see the differences right away. I had a couple hours to play today so I manipulated a few of our simple scripts from last week. Using a loop, arrays, and a couple of 'if then' statements, I am able to control the location, size, and color of many objects. In the examples I am using a bunch of spheres. The session this week will work on surfaces. Here is a link to the RVB file. Through a new initiative at Taubman College and the University of Michigan, five faculty grants have been given to support the development of a project through making. My proposal entitled "In Search of the (w)Hole" was selected to be carried out this summer (to be completed by September). It was Robert Le Ricolais, early pioneer of surface and space frame structures, that said "the art of structure is where to put the holes". His eloquent statement is even more relevant today given the ability to link the precision of the computer with the precision of computer controlled cutting equipment. While his statement was in reference to building-scaled openings, it is true of smaller scale cuts, perforations and slices and his statement highlights the potential of a detail to inform a process. Digital Fabrication is most often celebrated for the construction of exuberant form achieved through extreme material usage. In this equation computer driven tools process neutral materials, resulting in bins full of saw dust or foam dust. This process perpetuates the idea that form comes first and construction is the act of replicating the form in the most exploitable material. The Research-Through-Making Grant offers a chance to give material and process an upper-hand where forms might emerges directly through experimentation. This proposal takes a defiant stance against form over material. Two-dimensional cutting of sheet metal offers many opportunities because of the abundance of local shops equipped with cutting technologies and an array of readily available building materials. It is in these routinely used tools and materials that a designer can make the most significant impact, altering the landscape of production. 2D cutting is a subtractive process creating a strong conceptual and structural link where the removal of material both reduces weight and potential strength. The use of sheet metal allows for the creation of lattice or surface structures dependant on material properties and material organization. The assembly of the cut sheet metal extends the structural logic through the location of holes or tabs for potentially complex assembly by unskilled labor. This project will be used to build a structure capable of spanning at least 25’ which will require multiple assembled parts to achieve the required length and depth. 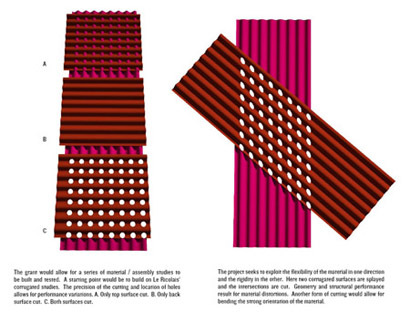 Beyond the dimensional constraints of most materials available under 25’, the project aims to span beyond the scale of most lost-cost conventional framing systems (standard wood framing) while offering increased material and spatial affects. The images included in the proposal are to help explain the general themes of the research more than to show that this is what will be built with the funding. 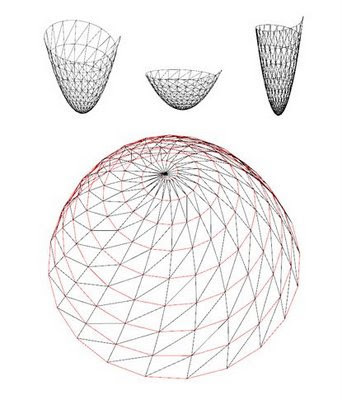 The corrugated studies and conical studies are more of a starting point to initiate the research. 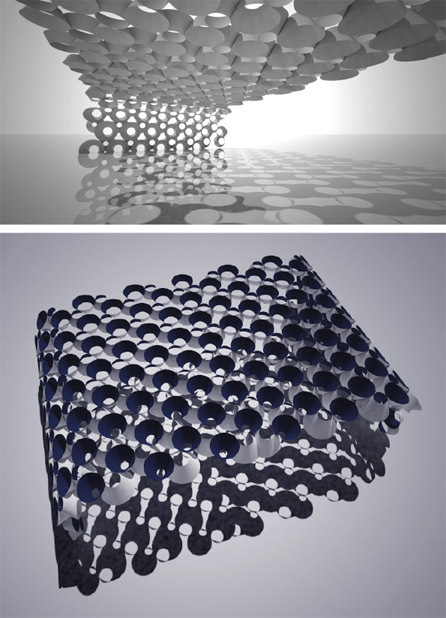 As feedback is gained from initial material studies, the project and the form may move in different trajectories to fully investigate material outcomes or assembly techniques. 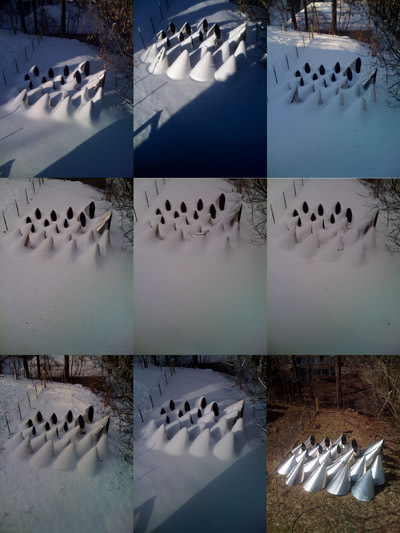 The experiment is almost over... Rather than simply recycle the Fire installation I put it in my backyard to watch it collect and drift snow during the winter. I hope the snow is finished for the season. Currently working on a project for a small restaurant in Ann Arbor. 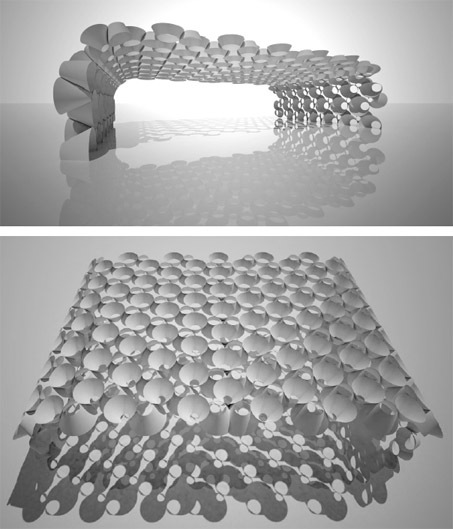 Here are a few studies that continue the explorations into developable surfaces and smart surfaces. At this point it is not clear if we will have the time to explore a dynamic / responsive system or simply develop a restrained surface to create subtle distortions in the ceiling to allow for HVAC and lighting requirements. Here is a parametric model that looks at using two servo motors to create s simple wave movement. 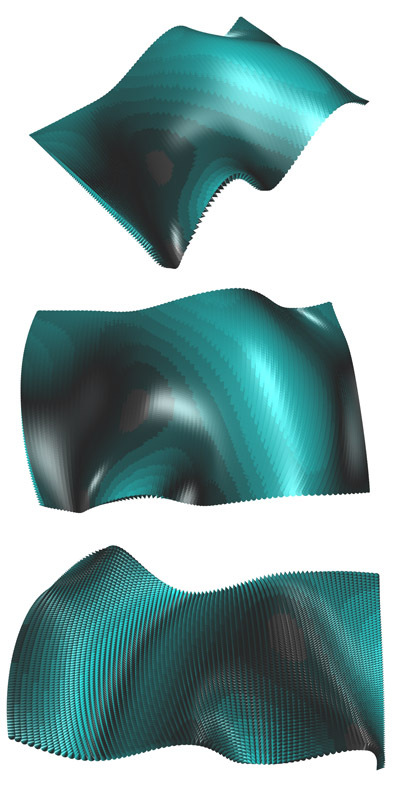 Simple walkthrough of a static surface illustrating the open and closed conditions of the surface made of sheet metal strips.